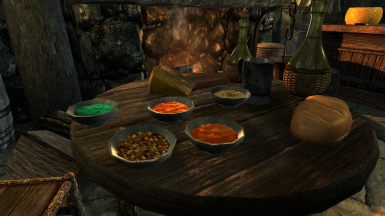 Port of Jokerine's Mushroom Soups from Oldrim to SSE. 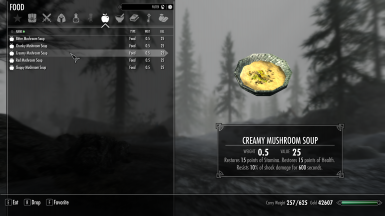 Adds 5 new craftable Mushroom soups to the game. I will follow the permissions that Jokerine set down originally. If you plan on converting this mod to another game, please make sure to credit both Jokerine and I for this. The .esp has been saved in form 44 and the mesh has been processed through the current version of SSE NifOptimizer (3.0.5) for compatibility. No cleaning was necessary and this mod does not require any DLC. This is a straight port from Oldrim and is offered as-is. I have it installed in my game and it works fine. Let me know if you have any issues with the files. I know there are a lot of food mods out there but not any mushroom foods as far as I know. If there is then my bad. Here is some extras for ya. Plus it gives you something else to do with all of the mushrooms you harvest as well. 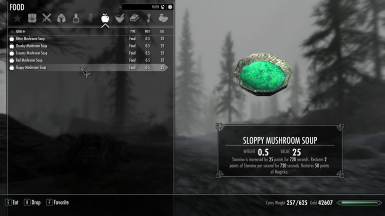 Please note that this mod can be made compatible with other food mods on SSE but patches will have to be made for it. 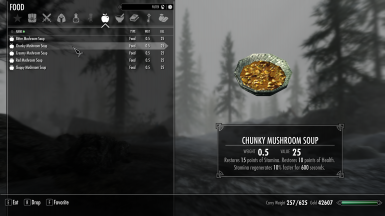 If I get enough requests for certain food mods, I or someone else can make a patch for it. 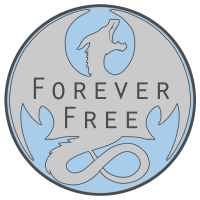 If someone else does make a patch for the appropriate mod, I can and will upload the patch under "optional" files and give them full credit for it. Not an issue at all. I will update the compatibility section with different mods as they become available. I do work full time and cherish my days off so I try to make the best of them. Thank you. 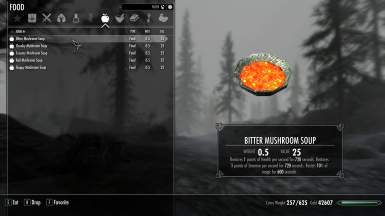 This simple mod was a request for some soups made with mushrooms, and as always, I'm happy to help! The file has been cleaned with TESEDIT and requires no DLC. Special thanks to go to InsanitySorrow for the amazing Food Stuffs Resource. To install, extract the contents of your downloaded file to your "Steam/SteamApps/Common/SkyrimSpecialEdition/Data" folder. Then activate the mod through your preferred launcher by ticking the checkbox next to the esp. The Nexus Community: For a great group that makes modding and gaming fun. Thank you. This is another simple port from Jokerine that worked out really well. I have other Jokerine mods to port over around the holidays. These are themed and will be brought over at the right time barring any issues with meshes, CTD's and worldspace issues and other mods altering the areas. Let me know if there is any issues with the file. Enjoy the port and good luck.